Free home delivery - Special only this month ! BENCH17069DIMENSION: 49" x 18" x 20"HFEATURE: Walnut Finish & Cream PUP..
18c, kab bench 96515Item Number : 96515Feature : 18c, kab benchDi.. Fabric ColorGREYMetal FinishGOLDDescription	Width	Depth	Height	Seat Depth	S.. Fabric Color NAVY BLUEMetal Finish GOLDDescription	Width	Depth	Height	Seat .. Item Number : 20653AFeature : BEIGE BENCH @NDimensions : 55".. Fabric ColorBEIGEWood FinishDARK BROWNDescription	Width	Depth	Height	Seat D.. Fabric ColorGREYWood FinishDARK BROWNDescription	Width	Depth	Height	Seat De.. Finish Color NATURAL / GRAYDescription	..
Model Number: 500574Dimensions:Width: 47.5 x Depth: 15.75 ..
Part of the 501548 Collection by Scott LivingModel Number: 501548.. Fabric Color GREYFinish Color CARPOLYDescription	Width	Depth	Height	Seat He.. Fabric Color GREYFinish Color ESPRESSODescription	Width	Depth	Height	Seat D.. Description	Width	Depth	HeightBENCH	46.00	16.00	18.00..
Wood FinishNATURALDescription	Width	Depth	HeightBENCH	45.00	15.50	17.00.. Fabric ColorBEIGEMetal FinishBLACKDescription	Width	Depth	Height	Seat Depth..
Modern farmhouse style has your name written all over it with the Arrowrock..
Is your home missing that one last special touch? The Bachwich storage benc..
Dimensions:Inches: 46" W x 16.25" D x 25.88" HMetric: 1168.4mm W x 412.75mm..
Dimensions:Inches: 50" W x 16.73" D x 23.5" HMetric: 1270mm W x 424.94mm D ..
Afton Lift Top Storage Bench Ottoman - Brown Bi-Cast 4730PUProviding stylis..
Afton Lift Top Storage Bench Ottoman - Cream Fabric 4730NFProviding stylish.. 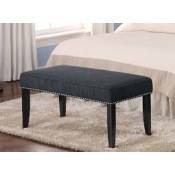 This industrial bench will add a dynamic flair to your living room or entry..
A simple camelback shape brings out the elegance of these button tufted he.. Item DescriptionFor a more casual look, this rustic bench is perfect for th.. BEIGE PU/CHROME BENCH 96413Item Number : 96413Feature : BEIGE PU/.. Item Number : 60838Feature : BENCHDimension : 65" x 18" x 18.. Item Number : 72029Feature : BENCHDimension : 48"X16"X19"HP.. BENCH 96490Item Number : 96490Feature : BENCHDimension : 74".. BENCH 96626Item Number : 96626Feature : BENCHDimension : 40".. BENCH W/3 BASKETS 96622Item Number : 96622Feature : BENCH W/3 BAS.. BENCH W/STORAGE 96620Item Number : 96620Feature : BENCH W/STORAGE.. Item Description This brown upholstered bench is an impressive.. Item DescriptionElegant in design, this bench is fully upholstered in an.. Item Description This large storage bench offers functional st.. Item DescriptionUpholstered in tan woven fabric, this contemporary storage .. Item Description Keep your entry way uncluttered with the usef.. Item Description A leather like black vinyl contrasts beautifu.. Item Description That stately upholstered bench will make a st..